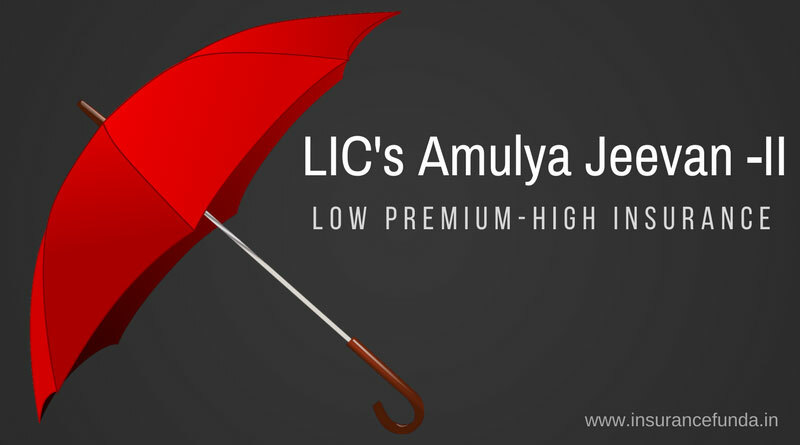 LIC Amulya Jeevan – II (T-823) is a pure Term Insurance plan from Life Insurance Corporation (LIC) of India. In other words, Amulya Jeevan is a regular premium paying, conventional, without profit, pure protection plan. Term Life Insurance or Protection Insurance is the cheapest form of Life Insurance available in the market. Term Insurance offer you high value protection on the occurrence of an unfortunate event and that too at an affordable cost. Read more on Term insurance policies and things to know about it. Amount of Insurance Coverage needed for you can be scientifically evaluated using the human life value (HLV) concept. You can use Human Life Value – calculator to calculate insurance coverage needed for you in few simple steps. Use the calculator given above to get a clear idea of LIC’s Amulya Jeevan plan. Just enter the basic details like Age, Sum Assured, Term etc. and click the ‘calculate benefits’ button. A benefit details chart also will be available on click of a button. Insurance coverage equal to Sum Assured shall be available for Normal or Accidental death during the term of the policy. As it is a pure term insurance plan, no maturity benefit shall be payable after the premium paying term. Income tax benefits shall be available on the premium paid under section 80 C of Income Tax act. Read more on the Income Tax Calculation and income tax benefits. Amulya Jeevan – Important things to remember. Minimum Sum Assured available under the plan is Rs.,25,00,000 If you want a lower insurance coverage, you can go for LIC’s Anmol Jeevan -II plan . Grace period for premium payment is 30 days. If the premium is not paid within 30 days, policy will get lapsed and insurance coverage will cease. No surrender value or loan will be available under this plan.